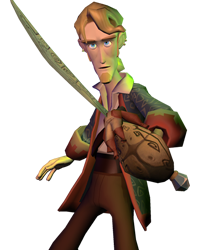 Back in 2009 I Preordered all of the Tale of Monkey Island series. I can find links to download it for windows and mac. Now that it's released for iOS is it possible to get download codes for the iTunes store so I can play it on that platform too? Unfortunately we cannot transfer game licenses between platforms. If you'd like to play the game on your iOS device, you will need to acquire it through the iTunes App Store. I apologize for any inconvenience this may cause.